Charming Old Town home with hardwood floors, open kitchen, 3 bedrooms, 2 1/2 baths in great walk to school and park location. Just listed in the MLS for $547,500....screen porch. April 29th, 2010 from 1-3 pm. Join other knitters in the Library's Board Room. Conversation, knitting and light refreshments! Every skill level welcome. Newcomers welcome. There is always someone willing to answer questions. No registration required. Future dates:May 13th, and 27th from 1-3 pm. Come enjoy fellowship and learn a new stitch! 7 pm on Wed. April 28th, 2010. Learn from Nina Koziol, garden writer, the plant combinations that thrive in sites offering full shade to part shade. Tuesday night and Wed. from 10 am to noon and half-price from 6-8:30 pm on Wed. Call me to see this great investment. Hurry orders due this Wednesday, the 28th of April. Pick-up is Wednesday,May 5th 11:30 am until 5 pm in the handicapped parking lot north of the church. Proceeds from this fundraiser benefit St. John of the Cross parish and school. Call Kelly, 708-246-7511 or Karen, 708-784-1629 for order form. Some examples: 7" Hydrangeas for $22, 12" Deco-pot Geraniums for $32, 4 1/2" potted plants for $3.50, hanging baskets for $18 and much more. 8 am to 2 pm...TODAY, April 24th and 8 am to 2 pm TOMORROW, April 25th. The sale features hardcover and softcover books as well as music and audio books. 4731 Grand Avenue - Listed for 37 days in 2009 at $1,189,000. Back on in 2010 for $1,199,000 and sold in 4 days for $1,150,000. Closed on April 22nd, 2010. Built in 1910 and an addition, lot 60 x 187, 4 Bedroom, 3 1/2 bath, 2 car garage, 2 fireplaces and only a 2 block walk to the train!!!! Houses for sale in Western Springs New Listings! Call me to represent you as a buyer's broker....full-time agent in Western Springs for the past 30 years! 4835 Wolf Road, Western Springs Charming cottage style home on 66 x 215 lot attractively priced at $365,000....call me to be your buyer's broker! This home was on the market for 667 days. Originally listed in July 2006 for $1,299,000 it was just a home that was not built yet. In Mid-2006 they put it at $515,000 in an attempt to sell the house that was on the lot. Back on in April 2008 for $1,549,000-price went up in Sept. 2008 to $1,629,000. High end home with 6200 sq. ft-4 levels on a 50 x 213 lot. 3 car garage. Reported closed in the MLS on April 19, 2010 for $1,360,000. 5/3 3-8:30 pm, May 4-7 3 - 5 pm, May 9th noon-4pm. New Listing in the MLS....3 bedroom, 2 1/2 bath Sears home in walk to train and town location. 70 x 125 lot for $299,000. Hurry this won't last! On the market for 488 days this home started at $739,000. Last list price was $629,000 and home sold for $540,000 as a short sale. 4 bedroom, 2 1/2 bath with a family room. On the market for 164 days. Originally listed for $539,000 and lowered to $499,000. This home closed on April 16, 2010 for $418,200. 3 Bedroom, 1 1/2 bath, 1 car garage on 60 x 131 lot. Home needed updating. 4 Bedroom,3 bath home close to schools and park in Old Town. Closed on May of 2007 for $610,000. Listed $625,000 and sold right away for $605,000. 1212 Chestnut is a 4 bedroom 3 1/2 bath with an additional bedroom in the LL. 50 x 130 lot. $799,000. Call me to show you this nice colonial. On the market for 1078 days. Originally listed for $509,900 and last list price of $369,000. Closed on April 14th, 2010 for $330,000.00. 3 Br, 2 1/2 bath home built in 1961. No basement and a 1 car garage. This brick home was only on the market for 3 days. Listed for $635,000 and sold for $600,000. 4 bedrooms, 2 full and 2 half baths on a 58 x 187 lot with a 1 car attached garage. Walk to town and train. 3 bedroom, 1 1/2 bath on 50 x 150 lot with 1 car attached garage. On the market for 165 days-listed $349,900 and lowered to $339,900 closed for $320,000 on April 13, 2010. April 15, 6:30 - 10:30 pm Come shop for fun, unique gifts. Eat, drink, laugh, shop-no RSVP necessary. Admission $5.00-come and bring some friends. There will be unique jewelry, fun belts, cool t-shirts, leather purses, Swarovski Crystal flip flops, First Communion and Graduation gifts, Beijo bags, monogrammed items, Gigi Hill totes, home accessories, painted signs and stools, picture frames, little girl hats/hair clips and refreshments. Brought to you by The Saint John of the Cross Women's Club. This home is located at 910 Elm in Old Town South. There is a contract pending on it. Two new homes have been listed in the MLS last week in this location. Excellent area close to town, train, parks. Great place to live and fun for the whole family. I raised 3 children in this neighborhood. We lived on the 4600 block of Grand for 23 years. They loved walking to town and Spring Rock Park. Old Town South just a block to the Burlington Northern train. This home is listed for $549,000. 5 br, 2 1/2 bath on 50 x 170 lot. Listed last week in the MLS. Looking to get into Western Springs?? This home listed in the MLS has been reduced to $240,000. It originally started over $300,000. It is 2 blocks to the train and town. There are 3 bedrooms, 1 bath. You can walk to Starbucks and Spring Rock Park from here. If you would like to see this property I would be happy to show it to you. I have access to hundreds of homes in the Western Suburbs and would love to take you to see them. Linda Hanley Kelly, Charles Rutenberg Realty, 708-334-5356. This Charming brick English in Old Town was on the market for 3 days. 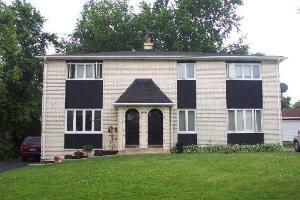 Listed for $539,900 and sold for $527,500. 3 Bedrooms, 1 1/2 bath built in 1933. The Highlands Middle School was honored with the "Apple Exemplary Program" recogniton for 2009-2010. Highlands Middle School is among only 38 educational technology programs nationwide to achieve this new recognition from the computer company. Apple representatives will make a formal presentation to Highlands' administrators at a future 106 Board Meeting. The La Grange Highlands School is attended by students from Springdale, Ridgewood and Timber Trails in Western Springs. Congratulations to the staff members who have spent hours upon hours engaged in professional development and planning in order to align their lessons with best practices for the 21st century....is it too late for me to go to middle school??? Here are some of the recent listings on the MLS. Some are new, some are relists with new prices. 4310 Prospect Avenue in Old Town of Western Springs-5 BR, 3 1/2 bath on a wide lot for $869,900. Here's a great one-Charming Sears home oozing with charm....4029 Johnson Avenue in Field Park of Western Springs for $524,900-Pictured! Call me-I can show you anything listed in the mls-I can also show you many for sale by owners. I have 30 years of experience selling homes in this town. I currently own two. One in Springdale and one in Field Park. The one I own in Springdale is for sale for $549,000. It was completely renovated in 2007. It is at 5116 Clausen Avenue. It is a brick ranch with an attached two car garage. Hardwood floors throughout, new kitchen, windows, roof, woodwork, doors, bathrooms, basement and more. Also in Springdale there is a brick ranch at 5205 Howard Avenue for $460,000. Nice solid home in need of updating. In Old Town South there is a 3 bedroom, 1 1/2 bath two story only a block and a half from the train for $539,000-4626 Lawn Avenue, Western Springs. These are just a few of the many homes for sale in Western Springs. Let's go see some of them. I love showing and negotiating the sale! Linda Hanley Kelly, Charles Rutenberg Realty, 708-334-5356 Broker.